Learn WCAG 2.1 and practical hands-on digital access skills from the experts, online at your own pace over 6 weeks. It’s one of the very few university-accredited web and digital access courses in the world for accessibility professionals… and was honoured in 2017! The PCWA was honoured for Outstanding Accessibility Education by being named among the 2017 Heroes of Accessibility, as judged and compiled by Knowbility in the USA in June 2017. Is for everyone who wants to upskill, no matter where you are – students take the course from North America, the UK, Europe, South East Asia, Australia, and more. Teaches the essential principles and techniques for achieving accessibility compliance. Helps organisations meet obligations under the Disability Discrimination Act in Australia, the Americans with Disabilities Act, and more, to not only reach more people more effectively, but to lessen the litigation risk resulting from inaccessibility. Assists Government departments (and agencies or contractors doing Government work) to meet mandated accessibility requirements as outlined by the Digital Transformation Agency (DTA). Guides management on international best practice in accessibility, including adherence to the W3C’s Web Content Accessibility Guidelines (WCAG) 2.1 and Section 508, etc. Provides students with the opportunity to discuss, share, connect and interact with other professionals facing similar challenges. Enhances your skills through learning from specialist lecturers and completing graded, practical assessments and validates your new-found expertise. Gives you hands-on experience of how people with various disabilities access the web. Enables teams to develop websites, apps and digital communications that work for more people, including the ageing population. Set your own pace over the duration of the course. 10-12 hours a week including assessment tasks. Three assignments examining website usability, captioning and compliance auditing. 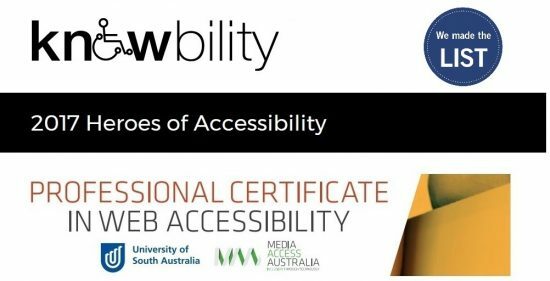 The video below outlines the main points and key benefits of enrolling in Australia’s only university-accredited web accessibility certificate for web professionals. An audio described version of this video is also available. Read more testimonials or our Alumnus Spotlight series to find out what students had to say about the course. 1. Why should you care about the online needs of people with disabilities? Students first gain an understanding of the challenges faced by users with a disability through hands-on experience with assistive technologies. This module provides the ethical, practical and financial arguments for implementing accessibility across your organisation. Focusing on the key institutions, policies and legislative frameworks that create and implement accessibility initiatives, such as the World Wide Web Consortium (W3C) and its Web Accessibility Initiative (WAI), students explore accessibility standards and how they have been adopted both in Australia and internationally. Week three focuses on the practical implementation of the WCAG 2.1 ‘A’ level of compliance, the relevant success criteria, and how to incorporate the guidelines into your daily work practices. This module focuses on implementing the success criteria of the WCAG 2.1 ‘AA’ level of compliance and the merits of striving for the highest level of accessibility, ‘AAA’ compliance. Although WCAG 2.1 receives the most attention, the W3C WAI also provides guidelines for authoring tools and user agents. Discover ATAG 2.0 and how these authoring tool guidelines can be useful to industry professionals who create or use authoring tools. The web is rapidly changing and new technologies bring with them significant implications for accessibility. In this module, students examine important trends such as the accessibility of mobile devices, apps and the cloud, their current accessibility and potential expanded accessibility, the way in which emerging HTML 5 and WAI-ARIA standards will provide support, along with the new Silver standard that will be focusing on what is likely to become known as WCAG 3.0. As someone who is legally blind, when Scott first attended university he had to get his text books read to him. He has since committed his professional life to improving access to the web for people with a disability. His work focuses on the accessibility of computer and internet related technologies, having completed a PhD entitled ‘The Disability Divide: A Study into the Impact of Computing and Internet-related Technologies on People who are Blind or Vision Impaired’. Scott is the author of Media Access Australia’s ‘sociABILITY: Social media for people with a disability‘ resource which is now used by the United States Government to help agencies improve the accessibility of social media. He is also the author of Media Access Australia’s Service Providers Accessibility Guide, designed to provide National Disability Insurance Scheme service providers with practical guidelines on producing accessible communications for people with disabilities. Scott is also the Specialist Adviser – Digital Accessibility for Media Access Australia and is a member of the Advisory Committee of the World Wide Web Consortium (W3C), the organisation primarily responsible for developing international standards for the web. Dr Ruchi Permvattana is a published author in the field of accessible e-learning and has completed a PhD (Information Systems) titled “The VIVID Model: Accessible IT e-learning environments for the Vision Impaired”. Other qualifications include both undergraduate and Master degrees in Design, specialising in online interface design. Dr Permvattana’s work experience includes several years of research for the School of Electrical and Computer Engineering, Curtin University, focusing on resolving online education for vision impaired students, lecturing and subject coordinating for the School of Information Systems at Curtin University, and the creation and the design and development of accessible websites. Dr Permvattana’s primary career goal is to work towards improving the independence and employability of people with a range of disabilities. Registration cancellations will not be accepted unless made in writing to the event organiser, who can be contacted via info@mediaaccess.org.au and mark the subject field with: Cancellation notice of enrolled student in PCWA course. Please ensure that the email carries an official email signature that corresponds with the name and contact details of the enrolled student, otherwise ,the email will not be considered valid. Cancellations made more than thirty (30) days prior to the commencement of the course event date will be refunded less 25% of the registration fee to cover administration costs. No registration refunds will be made after this time. Note that an additional refund processing fee of $25 AUD plus GST is payable by the cancelled registrant for all refunds requested and processed by Conference Online, if their enrolment was made through Conference Online.